KARL: I love the invention of fast food. And color TV. Yes, I should have saved this for the "Kid Quote of the Day" but frankly, it was just too perfect of an opener for what will prove to be another one of those stories of vehicle disaster that keep my checkbook perpetually empty but my blog rich with content. Which reminds me of the time the financial planner who manages my IRA called to suggest that I take advantage of some unprecedented bond rates. He was new to the company, which, after reading this exchange, really goes without saying. People who have BEEN with the company don't have me on their list of potential investors. They also don't park their cars near me. MR. BEAVER: (Name changed to reflect the eagerness) . . . and we really haven't seen rates this high in years, so we encourage you to invest! ME: Well how much money are we talking about? BEAV: Well, that depends on how much income you'd like to make off the investment. If you'd like to make $6,000 a year, you'd need to invest $100,000. But if you're comfortable with just $3,000 a year, you could invest $50,000. ME: Uh, yeah. I think I'd just be happy if I had $50,000. I'd also be happy if I wasn't driving a vile rental car, but that goes without saying as well. We were supposed to go to Nebraska for a celebration of my great-aunt and uncle's 60-year wedding anniversary last weekend. It was a chance to see a lot of relatives that I haven't seen in years (decades, really.) I had backed the van halfway into my parents' garage with the liftgate open for loading. We got everything loaded and were cheerfully discussing a stop at Starbucks as I put the van in gear and pulled out of the garage. Well . . . mostly out of the garage, which really isn't the same thing at all. Because I didn't close the liftgate. (Nobody else did, either) There's a BUTTON to close the liftgate. It really isn't HARD to close the liftgate. There really ought to be an ALARM that WARNS you that your liftgate is OPEN, Mrs. Dumas. YOU'RE IN THE GARAGE, MRS. DUMAS!!!!!! The back window shattered when the liftgate hit the top of the garage door opening. A board fell off the garage. About a gallon of tears fell out of my eyes. And so my parents went to Nebraska without us while we swept up glass and drove dejectedly (and with much wind and fumes) back home to deal with our broken crippled van. It ended up being more than just the glass. I found this out at 5:05 pm last evening, when the glass guy showed up, remarkably unable to meet his window of 8 am to 5 pm. I would have thought a 9-hour window easy to meet, especially when windows are their thing (see what I did there?) but apparently I was wrong. I'm wrong a lot. I was wrong, for instance, about it being only glass. The wiper was messed up as well, and Windowless Window Man (see what I did there?) told me that I'd have to get the wiper repaired before the glass could be replaced. Which meant I had to re-open the insurance claim that I'd opened on Saturday (when I was looking at the destruction through teary eyes and was convinced that the van was surely totaled) and closed on Monday (when the tears had all been cried and we decided it was really just the glass that HAD to be fixed, not the minor scratch/dent and garage paint streaks). The first body shop we called said they weren't scheduling repairs until August 13th. Uh oh. The second shop said they could get to it "soon" and that seemed hopeful enough for me to take the van out of the garage for the first time in 4 days and suffer the humiliation of driving it over there. Because people look at you when you have no back window in your van. They pull up beside you at stoplights and gaze at you like you're a trained driving monkey who may or may not realize that the window is missing and should they say something to you? YES I KNOW MY WINDOW IS MISSING!!! STOP STARING AT ME!!! I could have covered the window-opening with plastic, but I was only going 3 miles. The good news is that the body shop people were AWESOME! Lee said he'd get the parts on order, work on it TODAY and have it ready by 4pm tomorrow. AND I heard him ordering new little "Town & Country" emblems to replace the ones with garage paint all over them. The lovely thing about insurance claims, after you pay the enormous deductible and inform your financial planner that your spare $50,000 will now go towards your higher insurance premiums, is that they fix every little thing that got damaged. Lee also called Enterprise (they pick you up) and arranged for them to pick me up. They picked us up. An hour later, after rooting through my van-contents-tote-bag and purse for any sign of sustenance, I decided to assert myself. ME: Excuse me? I have two starving kids here. Is there any reason that we have to wait on the particular car you chose for me? Don't you have, you know, other cars?! DUDE: Well apparently the person needed a ride home to (insert remote country area that's a 45-minute drive away) and so it's taking much longer than we expected. I called our other location and we can drive you over there to get a vehicle. ME: Wait. I thought you just "picked up". I didn't know you "took home". It really probably should say that on the commercials: Enterprise. We pick you up. We take you home. Even if it inconveniences our other customers and they have to eat their arms. OK, I didn't say that last thing. I just accepted the ride to the alternate location where my vile rental car was waiting. It's a Chevy Cobalt. Want to guess what color it is? The nice lady who drove us over there was apologizing even before we arrived, saying that they'd trade me out for something better when it became available. I said it didn't matter because we were only keeping it for a day and I could survive anything for a day. KARL: I liked the car that we rode in to get here better than this one because that car had automatic windows. ME: Holy cow! You're right - I didn't know they still MADE crank windows, or at least you don't usually find them in rental cars. Before anyone accuses me of being a window snob, it should be noted that John's car has crank windows, which is why the kids even knew what they are, but his car is pretty old. Actually, RC might be pretty old. That could explain a lot. EMMA: There are rips in the seats, Mom, but we won't make them worse, OK? EMMA: Mom! Karl's door is unlocked! ME: To lock it you have to push that little thing down. You'll have to do that to unlock them, too. They aren't automatic. And so, by the time we made it to McDonalds, Karl was proclaiming his love for the invention of fast food (and color TV) and I was expending my last little bit of energy to CRANK the window down to get our food. Kristi called me later and asked if I had to listen to FM radio, like animals. I told her that RC only had AM and that I couldn't talk because my feet were sore from propelling the car Flintstones-style. Oh yeah! It's my birthday! John took the day off! He, his mother and the children went shopping. For birthday gifts. For me! Oh, and for a fish to replace Albert the Second who went to the giant goldfish bowl in the sky, er wastewater treatment plant, the other day. He lasted longer than Albert the First, but Karl still feels that the name is not life-affirming and he plans to name the new fish something completely different. The trip to Atlanta/Tybee Island/Savannah was lovely. I should mention that our irresponsible sunburns were not TOO bad - just a little on the arms and shoulders - enough to make us change plans from a second day on the beach to a sightseeing sauna in Savannah. (Alliteration, so good at the alliteration) It was blisteringly hot. And sticky. I just hate it when it's sticky. But what I really wanted to say was that we did, in fact, apply our "sweater in a bottle" sunscreen, but we're both just too pasty to rely on mere sunscreen to save our glaring epidermi. And so I shall taketh no crapeth from ye readers who suggesteth that there's irony to be had here. The lady with the irresponsible tan is not to be excused. She was obviously seeking out the sun, or the tanning bed, or both. She WAS Magda. I'm just sayin'! I've been married to John for going on 12 years now. And you'd think that 12 years of marriage plus 4 years of dating would equal complete familiarity with all habits, humor and customs. John has this ability to regularly say something shocking that he claims to have either done or said, at which point I invariably respond "No way?!" or "You did NOT?!" and he laughs and says "You're so easy." When we were going through security in the Atlanta airport last week, it was extremely crowded and they let John go through with his shoes on, but then on the other side they took one of those white cloths that detects bomb-making materials and rubbed it all over his shoes and put it in a machine to test it. He passed. I just rolled my eyes. Obviously he wouldn't mouth off to airport security and I knew he was joking. Proud of my resistance to his usual fibbery, I decided to gloat. ME: Did you see that? You claim that you can always sucker me, but I did not react this time. I know you better than you think! JOHN: Very good. (pauses) Of course, in this case I really DID say that. My Mother-in-law has been visiting for two weeks. She was nice enough to stay with the kids while we were in Georgia. The last few days have been a whirlwind of activity between family gatherings, sightseeing trips, etc. I have not had much time for work, and because I don't want the new Harry Potter book spoiled, I must avoid the internet at all costs. This makes it difficult to hear news of CHA and all the fabulous new products. "Hey Drew" - on this one, the brackets, arrow and the listy-thing are stamps. The branches, owls, title and captions are rub-ons. I put the owl rub-ons on transparency first so I could layer patterned papers behind them. The color palettes on OA's papers are positively delicious! "Remember This" - on this one, I used circle punches with several OA papers (the papers are double-sided, which makes me happy) and then sewed the paper circles behind Foofala clear buttons using embroidery floss. Yes, this took a long time, but I was playing Monopoly with Emma and that also takes a long time, so I could get one or two buttons done per Emma-turn, and so therefore it really didn't take long at all. The same colors of floss were used to backstitch the borders and swirls. The EMMA letters and the bird are rub-ons. The rest of the images and captions are stamps. There isn't much to OA's website yet, but keep an eye out for these products when they hit your stores. I was blown away by the entire line! One more piece of business. 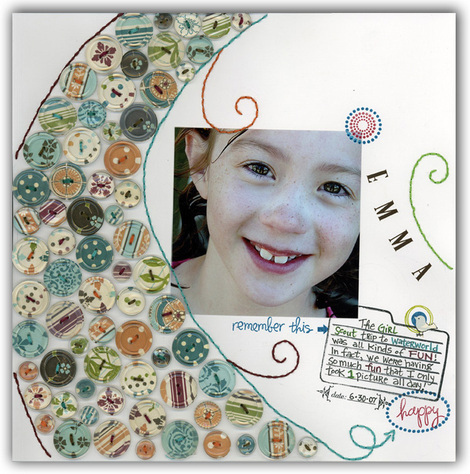 I'll be teaching Transparency Techniques at Scrapbook Destination in Centennial, Colorado on August 18th. The class is from 1-4. I plan to arrive when they open at 10 am so I can hang out and crop for a few hours beforehand. On my list of things to do this week is to deliver an original to display in the store, but until then, just follow the link to my website and watch the goofy video preview to see the project. It's just one page because of all the tricky interactive hoo-has, but you'll get enough extra paper and leftovers to make your own companion page later. Wait, one other piece of business. Lance Anderson, the owner of Rusty Pickle will now be teaching Inner Circle at scrapbook stores across the nation. I will also teach the class, but I don't travel nearly as much as he does, so the odds are that he'll be in your area before I will. I'm also going to be designing several more classes for Lance to teach when he travels, so if you like my interactive hooliganism, you'll have more opportunities to catch one of my classes when Lance comes to town. Be sure to bring some delicious snacks - it has been rumored that Lance will trade door prizes for food! In any case, the guy is a hoot, and you are sure to enjoy any of his classes. And now I must root through the pantry for an indulgent and calorie-ridden snack, pour an icy glass of diet coke (this makes up for the snack, right? ), and curl up on the sofa with a good book. Birthdays and quiet houses come but once a year! JOHN: (laughs) Hey, that's a great name for a band! ME: - I mean, she's a mother and everything. That's just too tan. What kind of example is she setting for her daughter? That cancer is cool? (I shake my head and move on) Do you think the band should be "Irresponsible Tan" or "Irresponsibly Tanned"? JOHN: I think "Irresponsible Tan" is better. John has come with me on a couple of teaching trips before. Usually the ones involving passports and exotic locales. We haven't needed our passports in Georgia although the plane we took from Denver to Atlanta was continuing on to Prague and we wondered if we could just stay on the plane without anyone noticing. But John had not had the pleasure of helping me run a DollarScrapbooking booth at a convention prior to this trip. I think he has a new respect for the rigors of my employment. And a sore back. Respect and a sore back. That's a good name for a band, too. We're hanging out on Tybee Island (outside of Savannah) for a couple of days to get some beach time in. We don't get much beach time in Colorado. None, actually. Yesterday we saw a man catch a shark from the pier. Today we swam around uncomfortably near said pier. We also rented jet skis, saw some dolphins, got matching sunburns and didn't bother with little trifles like lunch, so we're starving.